We are one of the leading manufacturers and suppliers of a vast collection of Figures and Animal Sculptures. This range is fabricated by making use of best quality raw materials. Our artists carefully etch out every minute detail of these sculptures. We offer this range to our clients at industry leading prices. We hold specialization in offering variety of Animal Sculptures that are made from quality marble stone and other stones. The range depicts variety of animals with their babies. This array comes with a firm base, which is flat to provide stationary base. We offer this collection in different shapes and sizes at best industry prices. 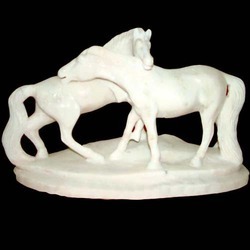 We offer an extensive range of Animal Sculpture of Horses. This array is made purely to represent the art and creativity. Horses are always known for their power and strength, and their depiction in sculpture represents a sense of power and strength. The range can be used for home and office decoration. As the range comes with a flat base, it can easily be placed anywhere. We offer this range to our clients, at most competitive prices. 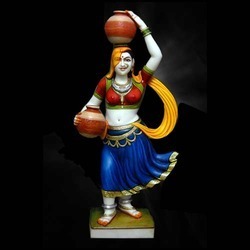 We are engaged in offering a wide range of Figure Sculpture of women. These are designed by our team of craftsmen and they beautifully depict village women and the normal rural women in the form of art. The range is made from quality stones and clay, and is colored with standard colors. Further, the textures are highlighted with heavy and light strokes of paint. These sculptures have a flat base and can be placed anywhere. Looking for Figures And Animal Sculptures ?